Sometimes it helps to have an entire set of tools with you to tackle a problem, and sometimes it helps to take the discreet route. 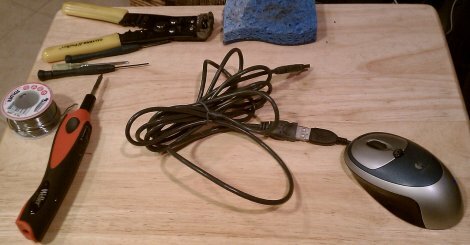 [StenoPlasma] took the latter of these approaches, and stuffed a USB hub, a 16 GB flash drive, and an Atheros based USB wireless adapter into a regular looking USB mouse to make a Linux bootable system in a mouse. Because he chose the Atheros adapter, he is also capable of doing packet injection with tools like Aircrack-ng, which can invaluable in a security audit or (white hat) hacking situation. This is the only photo we have, so it could be possible that the mouse is no more than a mouse, however we know all of what [StenoPlasma] claims is 100% possible, so we’ll give him the benefit of the doubt, and hope this inspires others to hack up your own mouse kits. Be sure to check out the full parts list after the break.